PHOENIX, AZ (January 12, 2017) – Kentucky Farm Bureau made a strong showing at this year’s American Farm Bureau Federation’s (AFBF) 98th annual convention. The organization came away with several awards and honors including the coveted Pinnacle Award as recognition for program and membership achievement. KFB was also well represented by way of their 2016 annual meeting winners in Discussion Meet, Excellence in Agriculture (EIA) and Outstanding Young Farm Family contests, all vying for national recognition in their respective competitions. Kirby Green of Daviess County finished in the top 16 of the AFBF Discussion Meet, while Ryan and Miranda Chaplin of Bourbon County, and Brad and Karen Hines of Hart County competed strongly in the EIA and Achievement in Agriculture events, respectively. Also being recognized was Harlan County Farm Bureau as a County Activities of Excellence (CAE) award winner. CAE honorees are recognized for innovative program ideas. Harlan County FB initiated County Forestry Days in which young people learned about the forestry industry. In addition to competitions and award announcements, voting delegates from Kentucky and other Farm Bureaus around the country weighed in on the nation’s top agricultural issues and identifying priority topics for 2017 advocacy efforts. Kentucky Farm Bureau’s (KFB) 25 voting delegates represented Bluegrass State farmers as national policy was considered. According to information from AFBF, resolutions passed by delegates included important measures covering regulatory reform, crop insurance, the inclusion of food assistance in the upcoming farm bill, school nutrition, biotechnology, energy and more. AFBF President Zippy Duvall said the actions taken by farmer and rancher delegates from across the nation represent the culmination of a year-long grassroots policy process. “It also provides us a roadmap for actions AFBF will take to implement our policies throughout this year, and I am optimistic about those prospects,” he said. KFB board members approved national priority issues at their December annual meeting including: support of a thorough regulatory review to ensure regulations do not impose an undue economic burden on any segment of society and the regulatory process is transparent and results achievable; supporting fair and open multilateral trade agreements that will open new markets and expand existing markets for U.S. agricultural products; and support of immigration reform that includes restructuring the H-2A program to streamline the process making it more reliable, economical and simple for farmers to participate. In addition to the general and business sessions, over 350 KFB members traveled to Phoenix to participate in a variety of industry-based seminars held throughout the event. More than 5,000 Farm Bureau members from across the country attended the AFBF annual convention. Kentucky Farm Bureau is a voluntary organization of farm families and their allies dedicated to serving as the voice of agriculture by identifying problems, developing solutions and taking actions which will improve net farm income, achieve better economic opportunities and enhance the quality of life for all. For nearly a century, KFB has served as the “Voice of Kentucky Agriculture,” representing the interests of agricultural producers and rural communities. The American Farm Bureau Federation is the nation’s largest general farm organization, working through its grassroots system to enhance and strengthen the lives of rural Americans and build strong, prosperous agricultural communities. 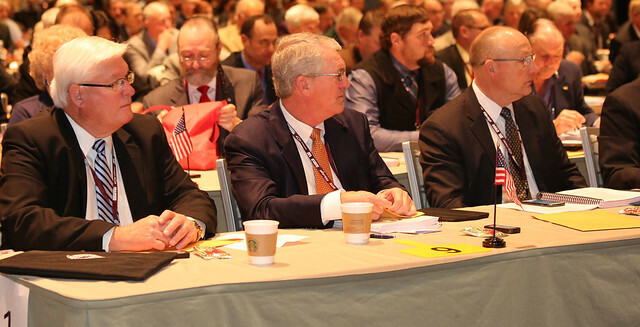 During its 98th annual convention, AFBF’s voting delegates – representing the interests of every state and agricultural commodity in the country – established priority issues for 2017 that will guide the organization’s efforts to improve productivity and profitability for farmers and ranchers nationwide. For additional information regarding the AFBF annual convention in Phoenix, visit annualconvention.fb.org.